Picture the scene: A cold, drizzly evening in November, the camera panning in slowly in from far above the streets of Finsbury Park, with the crackling distorted audio of film clubbers discussing new housemates and events of the day, as they tuck into a homemade Nigel Slater curry. Yes this was the opening of another great MNFC courtesy of Matt, emulating the opening of a classic film of paranoia and espionage, The Conversation. The Conversation is a 1974 American psychological thriller film written, produced and directed by Francis Ford Coppola and starring Gene Hackman. It was Coppola at his finest, sandwiched between the first 2 Godfather films, a director at the height of his creativity. In fact, The Conversation was nominated for three Academy Awards in 1974 losing Best Picture to The Godfather Part II. As Matt explained in his introduction, it won the Palme d’Or at the 1974 Cannes Film Festival, and in 1995, it was selected for preservation in the United States National Film Registry by the Library of Congress as being “culturally, historically, or aesthetically significant”. 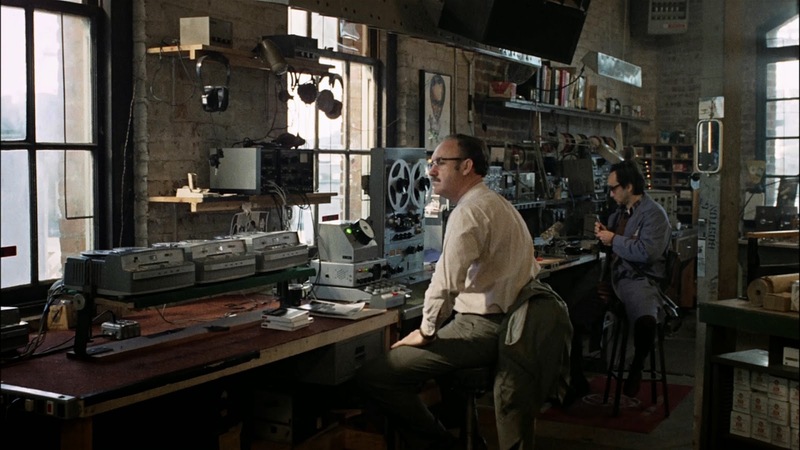 It focuses on Harry Caul (Gene Hackman), a surveillance expert who runs his own company in San Francisco. He is hired to track a young couple (Cindy Williams and Frederic Forrest), taping their conversation as they walk through San Francisco’s crowded Union Square. Knowing how technology can invade privacy, Harry obsessively keeps to himself, separating business from his personal life, even refusing to discuss what he does or where he lives with his girlfriend, Amy (Teri Garr). Harry’s work starts to trouble him, however, as he comes to believe that the conversation he pieced together reveals a plot by the mysterious corporate “Director” who hired him to murder the couple. He uses hi-tech techniques to refine and clarify the recording over virtually the entire movie – removing the echoing, whispering, weird buzzing harmonics – so that every enigmatic word is audible. The resulting tape is the focus of a film laden with suspicion and fear, and also becomes a symbol of Caul’s own loneliness and inability to form relationships. There are many over-arching themes and insights to this movie, often hailed as one of the most significant films from the 1970s. For example, this essay, which focuses on the manipulative power of corporate America, the consequences of ones own actions, and the characterization of Harry Caul. This last point in particular gave way to some interesting conversations between the film clubbers, who at times found him a hard character to penetrate and understand. If this was true for the viewer, it is also the case for the other characters in the film also, as he isolates himself and obsesses over his own security and privacy. The long far-away shot of the famous opening scene, and other techniques such as shooting through plastic, has led many expert analysts to hail the camera work of The Conversation as innovative. In the last shot of the movie, the camera pans from right to left, and then pulls back, just like a surveillance camera would do. There is constant distortion of sound which creates an atmospheric and uncomfortable sense of dread to the whole film. Now MNFC is towards the end of it’s second year, we have such a fantastic array of classic films in our back catalogue, and as such were able to find similarities to previous films shown. In particular, we noticed many similarities to Blow Up, in which photography rather than sound produced the mystery and obsession of its voyeuristic protagonist. On researching for this Tuesday Review, it would seem many critics and experts also agree on this comparison. Get us! It was also the second film to star our main man Harrison Ford, far before he started fighting replicants, as the aide to the mysterious company Director. The film was set in an era when the technology behind espionage was developing rapidly, and there had been numerous high profile bugging incidents. Arguably, the most famous of these was the Watergate Scandal, which began with the arrest of five men for breaking and entering into the Democratic National Committee (DNC) headquarters at the Watergate complex on June 17, 1972, and ultimately resulting in the resignation of Nixon in August 1974. In fact, when Harry Caul turns on the TV in the Jack Tar Hotel to blot out the of the neighbouring room, the broadcaster is talking about Richard Nixon and the Watergate scandal. We chin-stroked too about the relevance of this today, and felt such issues were even more pertinent in the present day. In fact, I’m writing this belated Tuesday Review with Channel 4 News on in the background, and a report about the Leveson Enquiry, the results of which are due to be published tomorrow. You can also get your own Private Detective remarkably easily, just look at this company based in Victoria. You are being watched fascists! Time to get out your saxophone just like Harry Caul, or steam clean your carpets for bugs just like Matt Grayson is planning to do! Onwards to December, and the Christmas Special, which will be hosted by MNFC newby Susan on 17.12.12. Details will follow! Until then, for your own sake, don’t get involved any further. We’ll be listening to you.